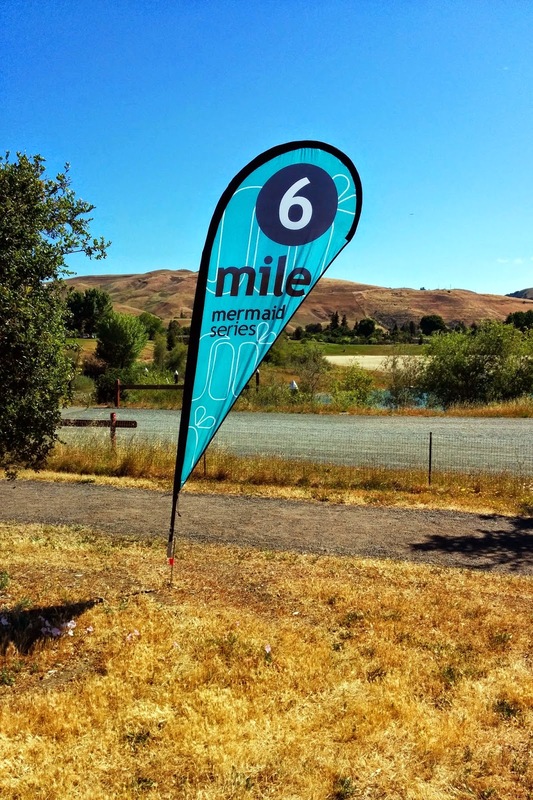 The Mermaid Run 10K in Fremont on Saturday was a blast! My friend Natalie suggested the event and it sounded like a fun time, plus I've always heard good feedback about the Mermaid races. Other than the Turkey Trot, which never goes well or feels like a 'race' day to me, I hadn't run a 10K since May 2012. I really should do more of them, it's a fun distance. Perhaps I'm feeling that way right now because I PR'd on Saturday? The race logistics were super easy. I picked up my shirt and bib at Sports Basement Sunnyvale on Friday after work, meaning no waiting in line on race morning. I left home at a comfortable 6:50 am on Saturday and arrived in Fremont around 7:20 am. There was quite a long line to get into the park where the race was staged, but it wasn't bad because I had plenty of time. They staggered the start times for the different distances, and I think that helped a ton. Shirt design is super cute. Parking was very close to the race start area so it was easy to run to the restroom and then back to the car to get ready. I met up with Natalie to walk over and we browsed the merchandise and sponsor tents before the start. The volunteers in the Mermaid coach area let me use their sunblock (I forgot mine...) which was a serious lifesaver. I'd been stressing about forgetting it that morning because I'm fair-skinned and like to burn. Thank you Mermaid coaches and volunteers! Pre-race photo op with Natalie. This was a pretty small race, about 300 in the 10K, so the start line wasn't very crowded and it was a mass start. I moved toward the front because I wanted to go for the PR; that turned out to be a good idea. 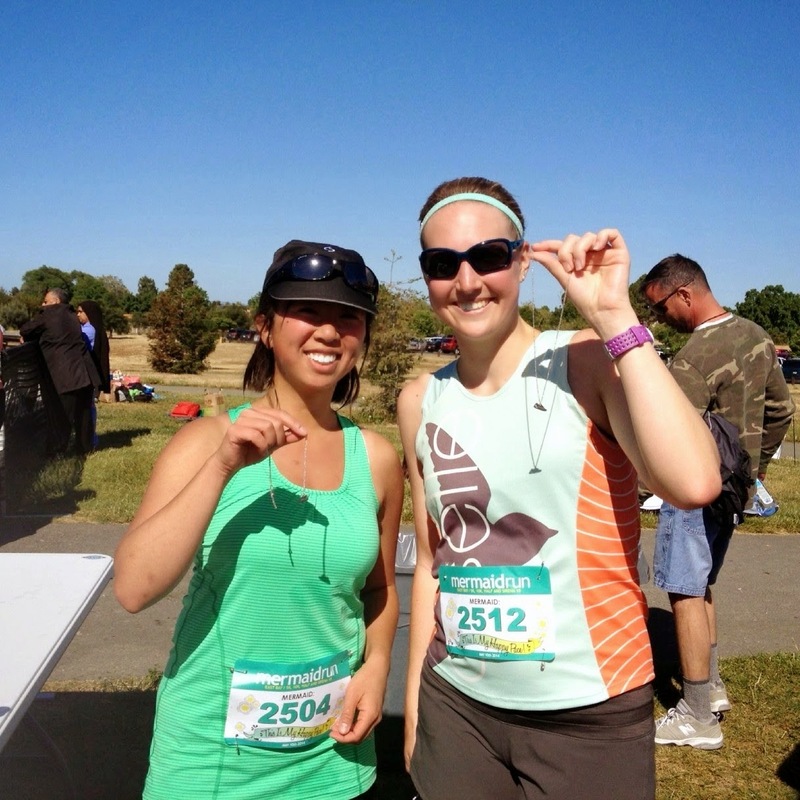 I chatted with Meg and her running buddy Leslie from Santa Cruz, then we headed off on our 10K way. I came out of the start quicker than perhaps necessary but went with the group. It was a narrow path, bike trails and sidewalks for a bit then opening up to slightly wider gravel paths for the majority of the run. Once we hit the gravel about 1/4 mile in I focused on my own pace, trying to settle in but to stay on PR pace. I KNEW I had a 10K PR in me, I just had to go get it. I'm not usually so confident; who knows what came over me on Saturday. For the whole race, I was pacing with another woman whose name I wish I knew. We briefly talked when jostling for single-line position through a thin spot so I know she's from San Jose but that's about it. I remember saying 'I'm running faster than is good for me' and then 'But screw it, I'm going for it even if I regret it later.' And I stuck with that mindset the rest of the time. I loved having her there because I felt like even though we weren't running together, we were somehow keeping each other going. We went around the quarry a bit and then to an out-and-back section, where I saw Leslie leading the way by a lot and cheered her on (She won!). That section was in mile 3, which was my slowest mile for some reason. There were a couple of tiny hills in that mile although the course was mostly flat flat flat. Around that time we hit mile 4 and I was hovering around another woman in black Nike pants who I made it my job to pass. We were right by each other for a good half mile or more, but I (and my new running friend) finally dropped her around the mile 5 marker. Pretty scenery, taken post-run of course. From there my brain just said go. No holding back, let yourself run, don't worry about what happens if you run out of steam. This is pretty unusual thinking for me; I'm always miss play-it-safe and worried about going too fast too soon. But you know what? It worked. Somewhere near the late part of mile 5, the finish arch came into view. I remember thinking the course might be short if the finish is already here, but I might as well run faster. So I did. We could see the finish for a long time, and then we ran past it to loop back. I like that I ended up pushing myself at the end for longer than usual because it gave me confidence that I could do it. The last bit involved sidewalk and then a turn to run uphill in grass (!!) to the arch. Kind of a mean - but awesome - finish, Mermaid. I congratulated and thanked my new run friend for keeping me going, and she said I kept her going too. Gotta love running with but not running with someone for motivation! 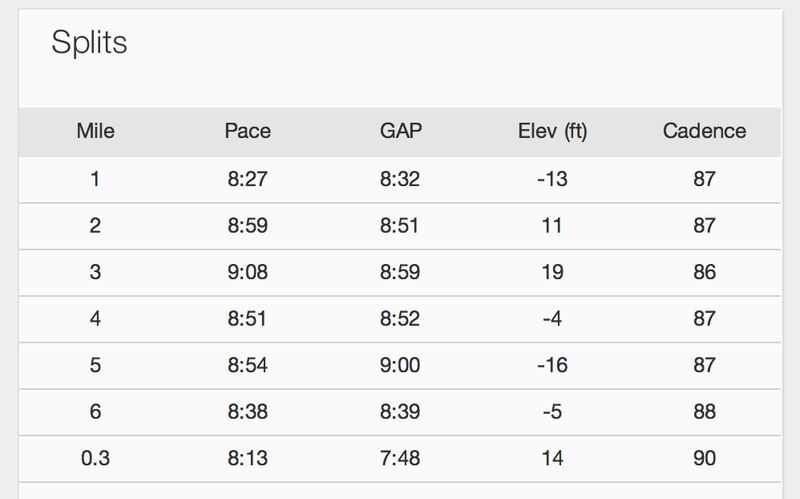 I was happy with my splits except for that 9+ in mile 3. I finished with an official time of 54:54, a big PR over my previous 56:39 from 2012. 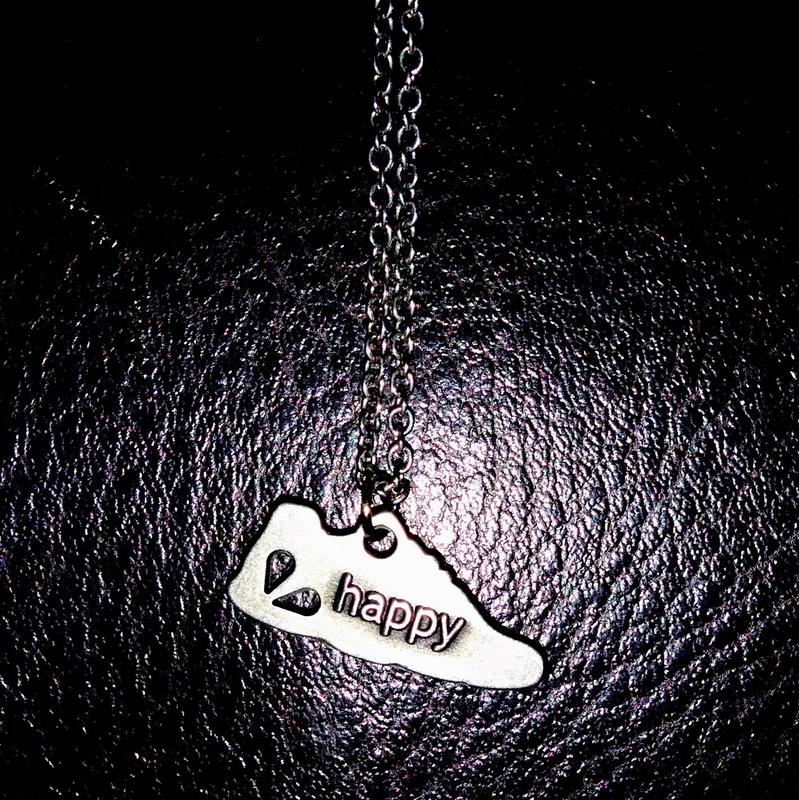 The finisher swag was a cute necklace in the shape of a shoe. On one side it says 'happy' and the other side 'pace.' I wore it to work today to celebrate my PR. 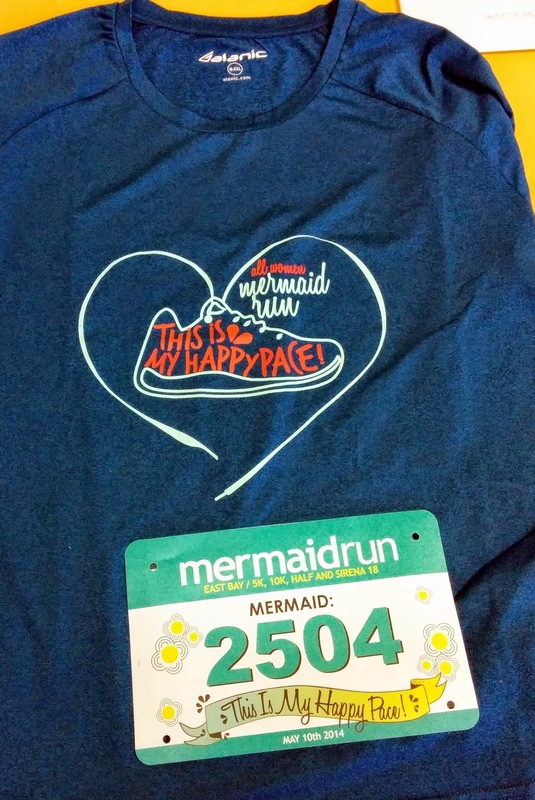 I'm a fan of the Mermaid race swag. Close up of the charm. With Natalie and our necklaces at the finish. Now, a few logistics for anyone considering the race. The course. The course is mostly gravel, so if you don't like running on dirt and gravel this race isn't for you. Otherwise I found it to be quite nice: flat, water views at times, wide enough at most spots not to cause any trouble. The out and back section was pretty short, making the course mostly a big loop. It is very exposed to sun which made it feel warmer, but the weather was nice. The support. The volunteers were very energetic and cheered us on! I loved it. There were more than enough water stops and no waiting for water or gatorade (sorry to the people I spilled on grabbing cups while running by...) They had many course marshals making sure each distance knew where to turn. One of my favorite volunteers was the course marshal directing us around the loop near mile 6; she was cheering 'pump those arms to run faster' and it made me smile. I don't know what food they had at the finish line area because I didn't want solid food yet and didn't wait in line, but they did have a food area. General Organization. The Friday packet pick-up at Sports Basement was convenient and saved me a line on race morning. I was also able to pick up Natalie's packet with a copy of her license. The line to get into the park could be an issue if you cut it close, but the lesson there is come early. Porta-potties and park restrooms seemed to be sufficient near the start line. The start wasn't crazy crowded and I never felt bunched in during the race, a bonus because I expected to feel crammed on the narrower course. Overall, I'd love to do another Mermaid event! Kevin took me out to ISOBeers in San Jose to celebrate. What's a race post without a celebratory beer photo? Congrats on a strong race! Having someone to pace off of really helps, doesn't it? The teamwork element of races is always kind of fun. Even though we're all competing, we're sort of pulling each other along and working together. Congrats again! Glad I got to see you, even if it was just for a few minutes! I love Mermaid events too and its such a great cause. I rocked my finisher shirt on today's run, it's pretty comfy (and looks super cute with my red Oiselle distances shorts ;) ) And lucky me, I'll see you again this weekend! Thanks and Yeah! Can't wait for Surfer's Path! CONGRATS PAULETTE! What an awesome PR - and I love the confidence and how you pushed yourself! Thats so awesome! That race sounds really great, and the shirts and necklace are so cute! Wish they did that race, or something like it, here! Thanks for signing up for me, and getting my packet! 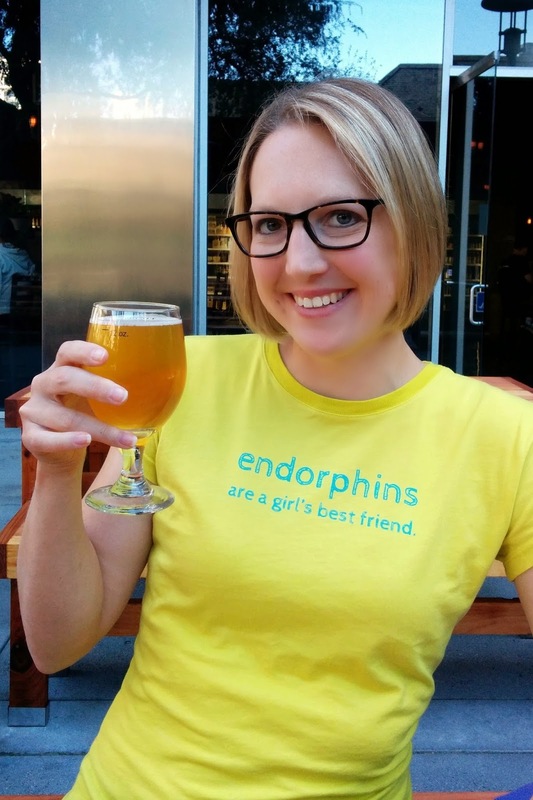 :) Also, love your endorphins shirt! So glad you suggested this race - loved it! Thanks! Yes I'm really happy with the necklaces AND shirts, nice bonus. Woooo! Congrats on the PR! Great splits!! Way to go! I saw this and regretted not signing up. I definetly want to do a Mermaid sometime :) And I've never heard of ISO beer. I'll have to check them out! Great job! It looks like such a fun little race! Congrats!! PR's are exciting :) The shirt is one of the cutest i've see in a while! And thanks for mentioning ISObeer...I hadn't heard of it but my fiance will LOVE it! Thank you! I love the shirt design too. Definitely check out ISObeer! Sounds like a fun race!! I have heard about the Mermaid races from a parent of one of my students.